Quarkspace is back with yet another in their Spacefolds series of instrumental improvisations. The main difference on Spacefolds 7 is that while for some time Stan Lyon had been an unofficial second guitarist, he has joined the band full time since the departure of Dave Wexler late last year. 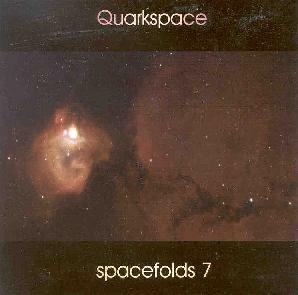 I've long said Quarkspace would appeal to progressive rock fans as much as space rockers and this is true more so than ever on Spacefolds 7. Believe me, the cosmic elements are present in heaping mind expanding portions, but there's a symphonic quality to the music that proggers would love. There's also a complexity to the music that isn't easily apparent, but if you listen close you'll hear multiple layers of keyboards, ambience, and endless embellishing electronic bits that serve to build a beautifully sonic whole. There's even a detour into minimalist Frippertronics territory on the giveaway titled tune, "Chippertronics, Vol 1". And though these are improvisations, the music has a composed feel that allows the listener to jam along with the band while never questioning the certainty of destination. But this is only natural as these guys have played together for many years now. A large part of what I enjoy is the combination of bass and piano with ambient space to give the music a sense of rhythm and melody that Quarkspace excels at. In summary, Quarkspace have an easily recognizable sound. No small achievement. And while comparisons are tenuous at best, it's safe to say that fans of Pink Floyd, Ozric Tentacles, Ash Ra Tempel, and the like would be thrilled with what they hear. And I have to throw in, as always, that the sound on Quarkspace CDs is top quality and listeners who submit to the headphones will find themselves in the first class section on the shuttle to the black, red, green, and blue stars beyond. Why pay the Russians $20 million when for $6 you can spend 70 minutes traveling to realms that mere human technology can only dream of?